What a start to school this year. My three oldest children are all at back school – in grades 4, 2 and kindergarten. Unlike most of last year, we’ve been getting to school on time and with everything we need. Er, well, except a few times… I seem to have misplaced a sports shirt for my daughter sometime over the summer holidays, and sometime in the space of 3 days, I misplaced one of my son’s school shirts. I’d like to blame it on my children for not keeping track of their own clothing, but I’m not really sure who’s fault it is. Last Friday morning, I accidentally slept 45 minutes late, which was our first late day so far. It was quite disappointing because I was so proud of everyone for being ready for school and getting there on time. 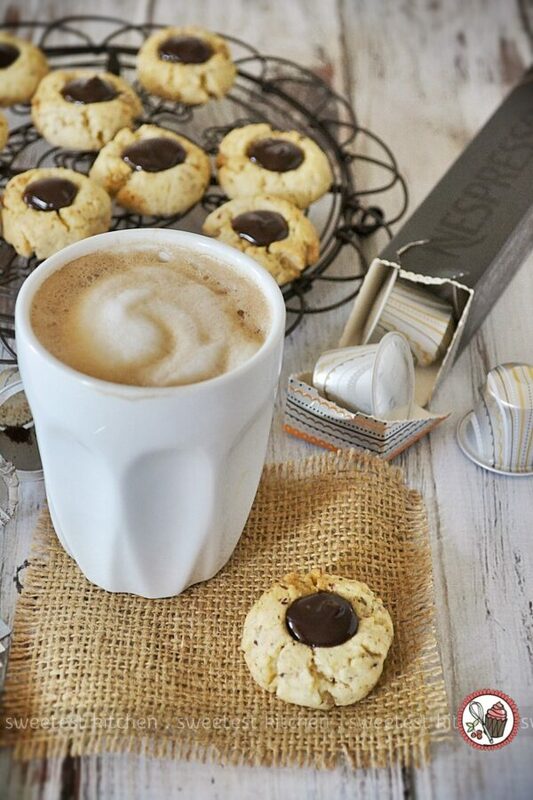 I’m still poking around in my last Nespresso delivery box and coming up with more ideas. 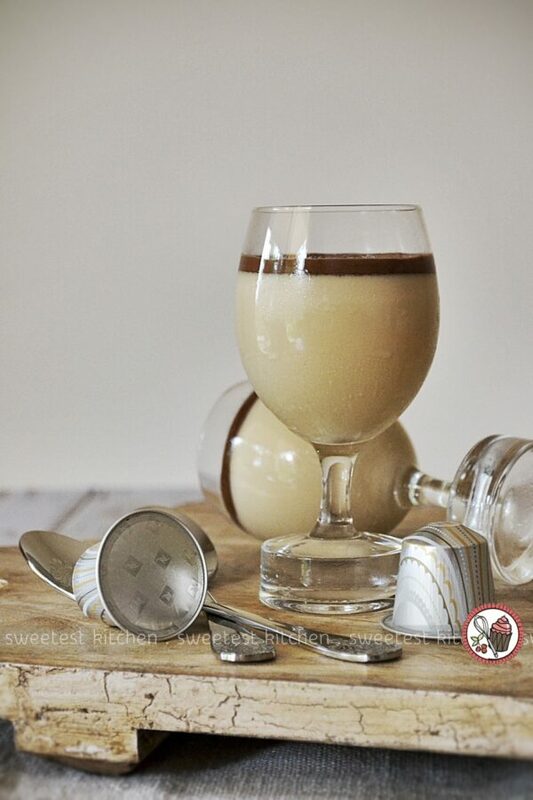 I decided the Hazelnut Dessert coffee needed to be next on my to-do list, and this hazelnut espresso panna cotta was born. And while they were tasty, I didn’t feel like they were of a high enough standard. It was basically a shortbready-type biscuit made with hazelnut meal and then filled with chocolate ganache that had been infused with Hazelnut Dessert. But I wanted something better. And these beautiful panna cottas were perfect. 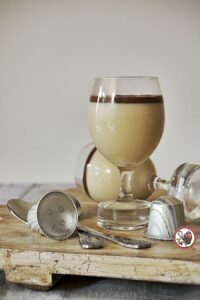 Made with a double shot of Hazelnut Dessert, this silky panna cotta is full of the flavors of hazelnut and coffee. For the icing on the cake though, I poured a layer of chocolate hazelnut spread on top. This was the best decision, because it ended up pairing so well with the flavors in the panna cotta and really made this dessert shine. In fact, it was so good, I am lost for words to describe it! So instead, I’ll just assure you that just because this dessert has a fancy name doesn’t mean it’s hard to make. In fact, it’s almost foolproof and so quick (not including the time it takes set, though) and easy. Keep in mind the panna cottas do need to be made ahead of time as they will require at least 4 hours in the refrigerator to set. The only problem I did have was keeping the panna cotta mixture from separating while in the refrigerator. To prevent this, I placed the panna cottas in the freezer and checked on them every 10 minutes. If they were starting to separate, I very, very gently stirred them until everything was mixed together again. While stirring, I had to be careful not to splash the mixture up the sides of the glasses, otherwise the layer of Nutella would be invisible as the spashes would have set all up the sides of the glass. I had to do this 3 or 4 times until the mixture had set enough. 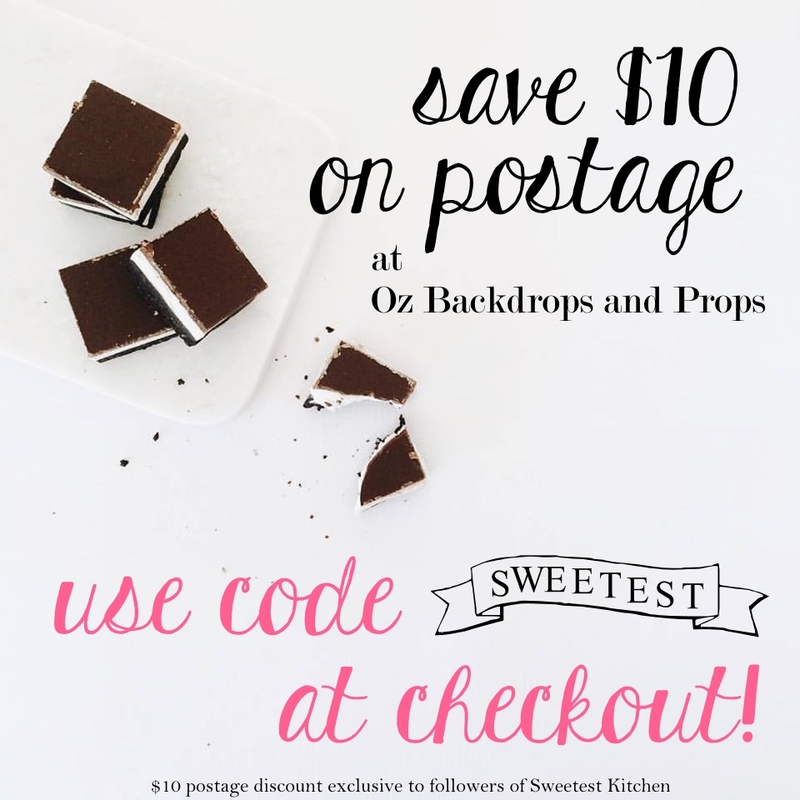 Another note to keep in mind – only add the layer of chocolate hazelnut spread just before serving, otherwise the spread will become solid and difficult to get your spoon through! 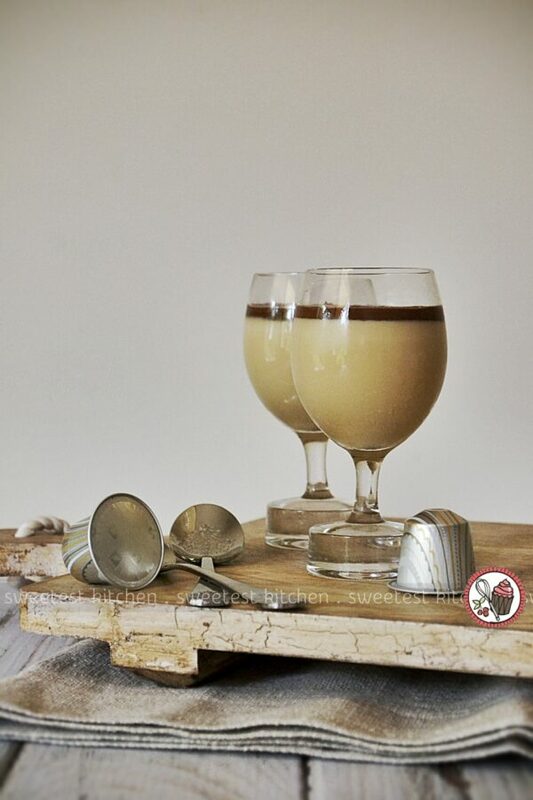 If you don’t have a Nespresso machine, or the Hazelnut Dessert capsules, which are a limited edition flavor, are sold out, substitute the Nespresso capsules with another hazelnut-flavored coffee, or use plain coffee, or maybe the best substitute would be to use plain coffee spiked with a hazelnut liqueur. Enjoy! 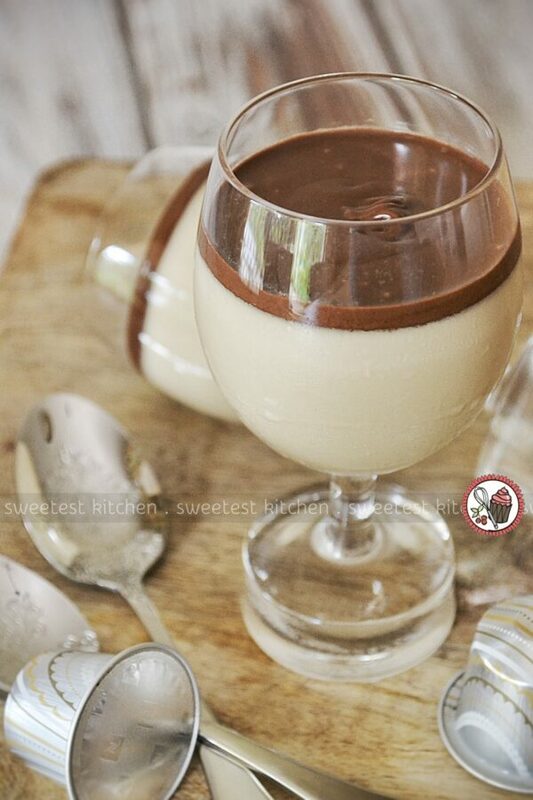 A delicious hazelnut-flavored espresso panna cotta layered with chocolate hazelnut spread. Pour coffee into a small saucepan and sprinkle the gelatin on top. Set for 5 minutes to allow the gelatin to bloom. Add cream, sugar and salt, place the pan on the stove and increase heat to medium, stirring well to dissolve the sugar. Heat for around 3 minutes, being careful the mixture does not boil. Remove from the heat, set aside for a few minutes to cool. Pour the mixture into serving glasses. I used a total of 3 100ml glasses, but did not fill them up completely. Place in the freezer for 30-40 minutes, stirring very gently every 10 minutes. This is to prevent the panna cotta mixture from separating, as happened to me (if your mixture isn't separating, just place the glasses in the refrigerator and skip this step!). Do ensure to stir gently so as not to splash the mixture up the sides of the glasses. 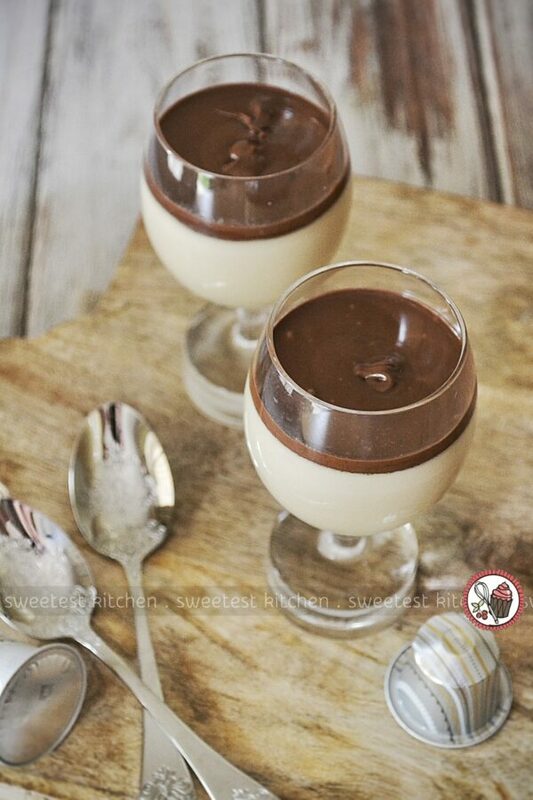 Once the mixture has set enough and doesn't separate anymore, place the panna cottas in the refrigerator and set for at least 4 hours or overnight. Just before serving, place the chocolate hazelnut spread in a microwave safe container and warm slightly in the microwave until it's pourable (should take around 15 seconds, don't make it hot!). 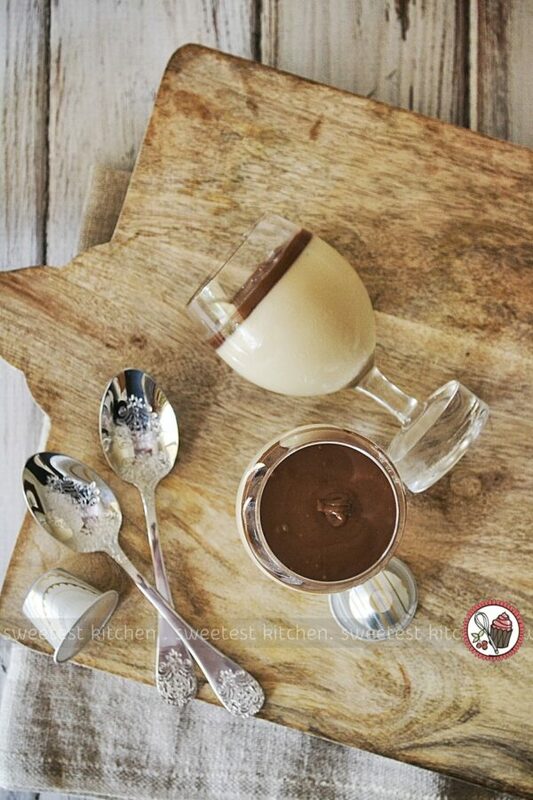 Gently spoon or pour 1-2 tablespoons of the spread on top of the panna cottas and shake/tilt the glass very carefully to get an even, smooth layer. Repeat with remaining panna cottas. The amount of the spread you need depends on how large your serving glasses are. Allow to set at room temperature for around 10 minutes, then serve immediately. * As a substitute, use strongly brewed hazelnut-flavored coffee, or strongly brewed plain coffee spiked with hazelnut liqueur, or just strongly brewed plain coffee. * I used Nutella, but you can use homemade choc hazelnut spread as well.